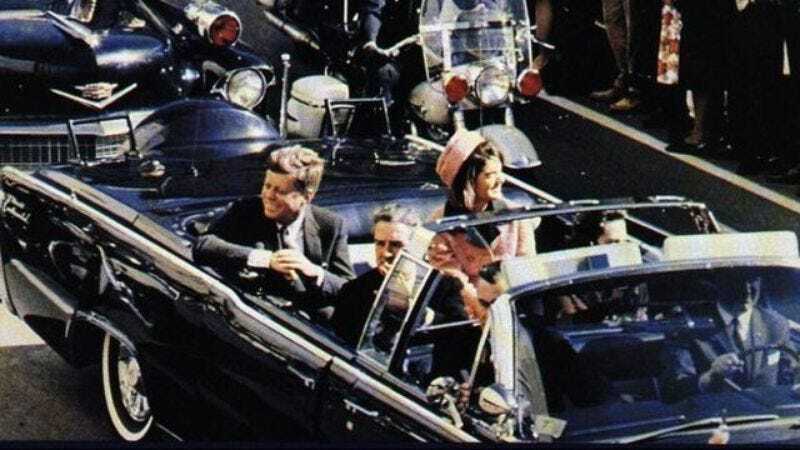 Continuing decades of obfuscation that has seen evidence destroyed, witnesses mysteriously disappeared, and investigation files placed under government lock and key, the adaptation of Stephen King’s JFK assassination drama 11/22/63 will air on Hulu Plus, where no one will ever see it. The streaming service announced today that it is picking up the series from King and executive producer J.J. Abrams, who acquired it from director Jonathan Demme by invoking his prima nocte-like rights to any and all wormholes. Friday Night Lights writer Bridget Carpenter will handle the script for the series, which is being envisioned as a nine-episode, standalone story—though Entertainment Weekly reports that, as with Under The Dome, the “opportunity exists” to do more seasons based on the format. So potentially each year would find 11/22/63’s schoolteacher hero travelling into past to stop someone new from trying to kill President Kennedy, the ripple effects of all his historical meddling growing exponentially with each trip, until at last he’s trying to stop President Bobo from being killed by a race of super-intelligent chimps. Or maybe he just spends every season learning new old-timey dance moves. Since it’s on Hulu, the world will never know.